This time my India trip was all about people. I had many discussions around religious beliefs, stayed in many homes, debated and discussed what needs fixing (and there is a lot and mostly I did not bring this up) and what works and why and of course enjoyed world’s most incredible diverse range of cuisine available; enjoyed gawking at incredible, ever evolving, new fashionable clothing like gowns, pant suits and palazzos, and breathtakingly gorgeous jewellery. Kerala: Diversity of fruits, plants and foliage all growing together and jostling for space and thriving alongside each other in Kerala is just astounding... And amidst vast tea plantations, valleys full of cardamom trees, are bamboo, jackfruit, coffee, Cocoa, plantains, banana, cloves, tons of green peppercorns, cloves, supari, papaya, guava, sitafal, mango and more. And all these teaming with equally diverse animal life including taher mountain goats, elephants, possums and vast vast varieties of birds like maina, bluebirds etc. My friend who accompanied me was like a walking encyclopedia on all native plants and pointed out each variety as we passed them by. Enjoyed chilling in house boat at Alleppey and enjoyed touring amazing Thekkady, Munnar in “God’s own country”, Kerala. God-crazy India – Slightly with a sense of alarm and slightly lovingly, I wonder if India has gone God crazy.. I found that there is a segment of Indian population that has clearly become more secular and refuse to partake in religion fueled divisiveness. Then there is a substantial segment that has become clearly much more religious. In the early morning of the day I landed and went to a small eatery, the waiter went and poured tea on a nearby tree and when questioned by me, explained that first tea has to go to the tree. Gods, rituals, and shrines keep multiplying in India and practically every Indian has a real ghost story. In one city, the government installed artistic statues of deities in the middle of four way streets to beautify the place. Very soon people began to go there and started praying there. I found catholics fiercely differentiating themselves from their closest siblings, the protestants. A Shiya Muslim cab driver was staunchly asserting that Hindus don’t understand the differences but all terrorist acts are always carried out by Sunnis and unequivocally stated there can never be peace between Shiyas and Sunnis. When my friend asked the cabbie to stop at a spirits store to purchase a bottle of alcohol, he said we should have said it earlier and then he would not have accepted us as passengers because it was against his religion to enable people to drink. A Hindu woman protested the assertion by Jains and Buddhists to be counted as separate religions because according to her they are all offshoot of Hinduism. Jains fear being swallowed and losing their identity in the amorphous and boundaryless system of Hinduism and equally staunchly assert their identity. And finally, as a most interesting experience, a Jain woman asserted how important are the differences between two sects of Jainism. One of the outward difference between the two sects of Jainism is that God keeps eyes open in one and halfway closed in the other. When I said it was a superficial difference, she explained how significant it was that the God kept the eyes halfway closed (never mind, that the statues are made by people). I came away feeling more like Ron Reagan Junior (an active atheist). One atheist famously has said, “most people are atheists anyway about most religions, I just go one religion too far”. Clothes Crazy India: Somehow I came away feeling like all of India and not Paris should be dubbed the fashion capital of the world. Incredible innovation in clothing styles and jewellery has made every Indian woman a fashionista, be it a cleaning woman, a beggar on the street or one living in a big mansion. There are incredible styles of clothes available to suit every pocket, everyone’s choice of color, style and size. In amazement, I stared at billboards and loved gawking and people watching at airports, hotels and on streets. Enormously hospitable and friendly India – During this trip to India, I stayed in many homes, connected with my cousins on mother’s side, father’s side, with friends and neighbors from early childhood and from school and college days and with friends visiting from California and their families and friends in India. My cousins, friends, neighbors, friends’ friends and families and strangers in whose orbit I came, accepted me as their own, and at the same time, gave me the best things, fed the best items. 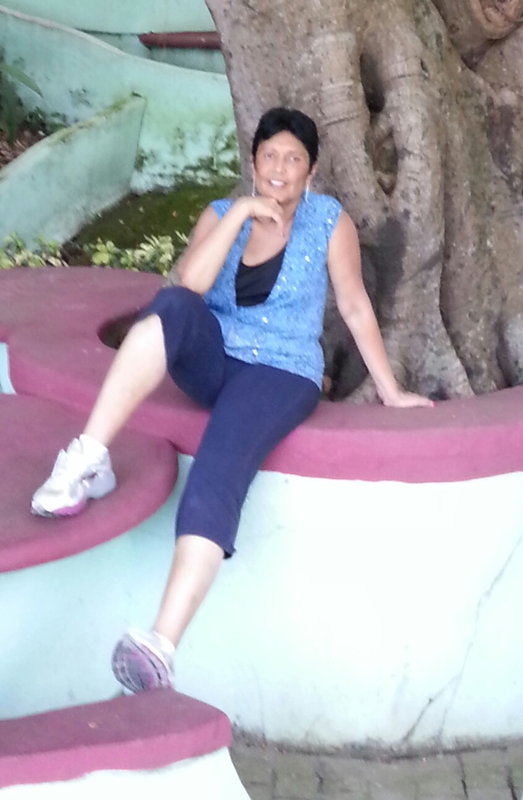 My heart was filled with love and gratitude in each home that I visited, and in each interaction. Even when people held different beliefs than mine, even when I questioned and debated, in the end, I was in their orbit and I was accepted based our similarity as humans. Over and over people told me that they loved to have me because I was so genuine and adaptable and I responded always that how can anyone not adapt when surrounded by such love and hospitality? I left eagerly for my homeland, but I left my motherland with a heavy heart. As I reminisce, I don’t miss the noise (it seems in India, there is a competition to rise above the din, bells in the temples are loudest, cars and scooters honk for no reason, people burst reams of firecrackers that last full 2-3 minutes when you cannot talk with the person sitting next to you inside a home, and even babies cry louder here). I don’t miss the air pollution (I yearned for a deep breath of fresh there). I don’t miss the dirt and grime (though there is considerable improvement in that). But I do deeply miss and remember people and their love, possibilities that exist, palazzos and pantsuits, gorgeous gowns, sarees and fashionable blouses that I wasn’t able to take my eyes off, the potential that India holds. We arrived in Munich, Germany and spent the day on our own touring the city, specifically the Central Marienplatz Square surrounded by Neo Gothic landmarks and high end modern stores. Next day we joined organized tour by Cosmos and started driving towards Prague. On the way, we stopped at Nuremberg, a city in northern Bavaria, distinguished by medieval architecture. The Hauptmarkt (central square) contains the Schöner Brunnen, the gilded “beautiful fountain” with tiers of figures, and Frauenkirche, a 14th-century Gothic church. Strolled the square and enjoyed gelato. Prague is capital of new Czech Republic. Part of Czechoslovakia, the Czech Republic was in a sort of a time wrap behind the Soviet iron curtain until 1989. When the curtain fell, a McDonald’s opened within 29 minutes and the country has not looked back since. Along with many trappings of the modern society, there are stark reminders of the past. The countryside is still lined up with insipid looking 10+ story buildings, many of them without an elevator, that were used to house the factory workers. The capital city Prague is bisected by the Vltava River and Charles bridge that is lined with statues of Catholic saints. Prague nicknamed “the City of a Hundred Spires,” is known for its Old Town Square, the heart of its historic core, with colorful baroque buildings, Gothic churches and the medieval Astronomical Clock, which gives an animated hourly show. Time was too short to enjoy this city with medieval charm and strong Austrian influence. Prior to World War I, Czechoslovakia was part of the mighty Austro-Hungarian empire. We did a quick deep dive into the history, palaces and churches of the city but I would have loved to spend time with the locals and learn more about how they lived under Soviet influence and relentless propaganda and what was it like to drink change through the fire hose when the curtain fell. Wowed by Vienna, capital of Austria. If Prague had a medieval feel, Vienna felt regal OR as locals say… It is very ShikiMiki…Situated on the Danube River, Vienna’s artistic and intellectual legacy has been shaped by it’s well known monarch, Maria Teresia and other Hapsburgs and genius artists like Mozart, Beethoven, Strausse and also Sigmund Freud. Strolling through the main square and landmark St. Stevens Cathedral and plague memorial was amazing. Besides tons of gelato, I also greatly enjoyed sunflower seeds bread and Saher chocolate torte at the world famous Saher cafe. Visit through the incredibly gorgeous Schönbrunn Palace and gardens gave an insight into the Habsburgs might and opulence. I was completely blown away by Budapest’s beauty and medieval charm. I did not expect it. Budapest, Hungary’s capital, gets it’s name by merger of two cities Buda and Pest, bisected by the River Danube. Its 19th-century Chain Bridge connects the hilly Buda district with flat Pest. Nicknamed Paris of the East with sweeping vistas all around, and vibrant nightlife, this is a city to enjoy… Hungary, once part of the mighty Austro-Hungarian empire, is now a very small country of 10 million residents of whom 2M reside in Budapest. Hungarians feel bummed out as they were invaded, annexed, and ruled by many Invaders. But I feel due to circumstances or whatever the case may be, Hungary also happened to be on the losing side in both world wars and that loss exacted a stiff price. In WW II, Hungary made a choice to side with Hitler to get away from the Soviet Union but when Germany lost then in the global arena it was a very small country to have a say and it came under the Soviet control…. So Hungary got dinged both ways; first the Nazis took a toll and then under the communistic Soviet control. Fortunately Budapest’s incredible architecture stands intact. There is SO MUCH BEAUTY TO ENJOY HERE. The dinner cruise on the Danube was the highlight of the trip. While the vegetarian food was nothing to swoon about the gorgeous views all around and lighted buildings kept us riveted, with camera in hand. Salzburg, Austria birthplace of Mozart, where the Von Trapp family of Sound of Music lived prior to escaping Hitler and where the movie is shot has sweeping views of the Eastern Alps with medieval and baroque buildings. To me, Sound of Music epitomizes freedom that sets you free to be a better human being and the courage it takes to do what’s right because freedom is a right but it’s also a responsibility and a privilege. On the way to Salzburg, on a rocky outcrop overlooking Danube river, adjoining the Wachau Valley, we saw Melk Abbey, originally built as a castle, it was gifted to become a church and survived threats and political upheavals. What’s an ordinary looking church from outside has entirely gold and gold plated interior with 40 kg of GOLD, its opulence meant to resonate with Benedictine tenet of “Glory to God in Everything!!!!!! At Salzburg, visited the places associated with the filming of the movie, walked through the town and ended up at the main square with it’s landmark cathedral, Mozart’s House, and shops and food. Bought Austria’s famous marzipan Mozart chocolates and Salzburg Schnapps and of course a day in any city in Europe must include gelato. We had our farewell dinner in Munich and took pictures, exchanged emails and departed next day with many beautiful memories. My daughter and I wanted to do a tour before she went away for next phase of her studies. The decision to go to Morocco was somewhat random and we were pleasantly surprised. We took conducted tour by Gate 1. 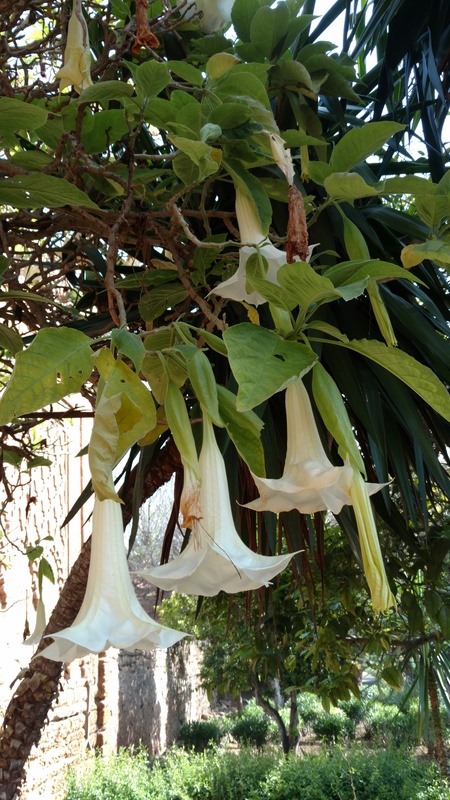 Our tour started in Rabat, capital city of Morocco. Morocco is in North Africa, bordering the Atlantic Ocean and the Mediterranean Sea. Originally inhabited by the Berbers, Berber is still spoken in Morocco, and it has Berber influence, along with Arabian and European cultural influences. 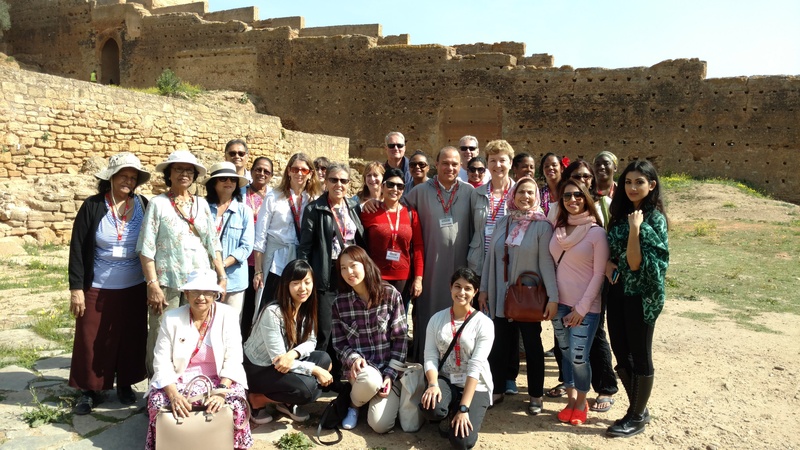 In Rabat, we visited the area where Royal Palace is located. Morocco has constitutional monarch with young king holding large powers. He married an engineer who was also a commoner and he is believed to be very progressive, passing several decrees that would benefit women. We also strolled among ruins of Chellah, one of the most ancient human settlements. En route to Fez, we visited the ancient ruins at Volubilis and I was surprised to find them very similar to other ruins I have visited. Well, guess what — they were from Roman empire. Roman empire had expanded to become one of the largest empires in the ancient world, had at one point covered about 20% of the world’s population and covered 2.5 million square miles. Volubilis has nicely preserved mosaics, Roman road and city layout and it is always fun to see Roman baths and even more fun to see Roman toilets where men sat in rows and talked while doing their job. The evening dinner at the home of a local family was one of the earliest highlights of this trip. They served wonderful 8 course meal beginning with sweets and followed by salad, breads, couscous, vegetarian pastilla (yummy), vegetarian tagine (traditional Moroccon dish cooked in special earthenware pots), followed by fruits, and more desserts (delicious) served with mint tea. In Fez, we visited the crowded medina (narrow walled city, with maze like streets), with beautiful Medersa, Moulay Idreiss mausoleum, fountains, and Fez’s famous tanneries. Fez Medina is UNESCO world heritage site. We wandered through the souk (market) watching traditional craftsmen, visited authentic Moroccan carpet store, visited exterior of gorgeous Royal Palace gate, walked through the Jewish quarter and all the while stopping to shop for knickknacks, while also trying to stay with the group. According to our guide, if we got lost in the Medina, it would be hard to find our way back and we would have to locate a Moroccan spouse. I memorized some key words, should that happen, “Habibi oheb buka”. From Fez, en route to Arfoud, we travelled middle Atlas Mountains and lush Ziz valley. We visited the fossil factory (fossils are big business here), a lively souk and one more opportunity to shop and negotiate and shop some more, and visited the 18th century ksar (castle). Then we traveled to Rissani (small city, on the edge of the Sahara). This was one of the most memorable experiences. We had a delicious meal, in a small oasis, in the middle of the desert. We relaxes in the shade for some time. Then we traveled more interior and finally rode the camels to watch the sunset. Until the sunset, we played in the sand dunes, carpet rode the hills (our guide pulled us down the steep hills on carpets, but climbing them back up took every ounce of our energy). We enjoyed absolutely incredible vistas with sky above in various hues and glistening red sand below (full of iron and no salt). En route to Ouarzazate (a city with a funny name), we visited truly magnificent Todgha canyons, which rose to steep 800 feet. We also passed lush Todgha and Dades valleys. We passed Meggouna valley of roses. It is filled with roses, and rose water, oils and creams from here are exported all over the world. We walked in a Berber village, constructed in 12th century and still inhabited by Berbers. Some of us hiked up to Ksar of Ait Benhaddou (enjoyed incredible vistas where many films have been shot), before proceeding through Tichka Pass (highest road point on Atlas Mountain chain) to the bustling city of Marrakesh. In Marrakesh, we visited Saadian tombs, dating back to the 16th century, the Koutoubia Minaret (law forbids any buildings to be taller than the Minaret) and the beautiful Bahia Palace. But Marrakesh’s main attraction was the Square and continued to be for the next three days. The busy square was populated with Henna artists, snake and monkey charmers (saw this monkey grooming the owner for almost 30 minutes), all sorts of knick knacks, street food and the square branches off in various directions into the crowded busy markets, another towards a road full of restaurants, and yet another road leading to horse carriages for carriage rides. En route to the beach and fishing town of Essaouira, we stopped at some Argan trees full of goats. Small round fruit of Argan trees have thick peel that the goats love. They used to freely roam and climb these trees and eat the peel and spit out the nuts. People gathered these spitted nuts and ground them for culinary and skin care use. But now Argan oil has become world famous, highly expensive, and a huge business here. So a few Government sanctioned trees where goats are allowed to climb, serve mainly as tourist attractions. Oh what a site. For some reason, goats are my favorite animals. I love mountain climbing goats, grassy plains goats and I just adored these Argan tree climbing goats. Another truly memorable experience. 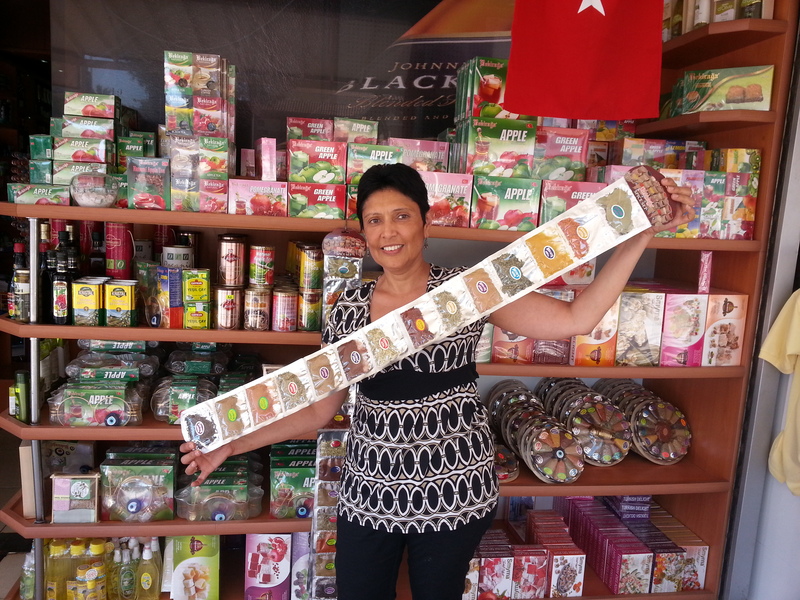 We visited argan oil factory, run by a women’s cooperative. Besides learning about argan trees and sampling some products, it was also a beautiful opportunity to learn about the democratic way this cooperative runs, where many women find friendships and support. In Essaouira, we walked the streets and while some enjoyed fresh fish cooked to perfection, Neesha and I stumbled into a small cafe serving vegetarian burgers. It was a wonderful meal, with the most delicious juice ever. It was date, almond, avocado, and orange juice freshly made with just the right blend of the ingredients. Finally, at Casablanca (Morocco’s largest city), we visited the incredible Hassan II Mosque. With 60 stories high Minaret, it is 13th largest mosque, topped by a laser light directed towards Mecca. Part of it sits on the Atlantic ocean, with sea bed being visible through the glass floor (which we did not see), and has a retractable roof. Inside its marble walls, 25,000 can gather for prayers and another 80,000 can pray on the mosque’s outside grounds. It is packed with worshippers during Ramadan. We also visited Notre Dame De Lourdes Catholic Church surrounded by beautiful stain glass. We passed by the Rick’s Cafe, started recently by an enterprising American but were disappointed to learn that “Casablanca” was not shot in Casablanca. What a beautiful trip. Morocco seems to enjoy a peaceful blend of cultures and its diverse terrain with high mountains, rugged coastline, winding alleys of the souks at Medinas, and sweeping desert, offered a range of experiences. Walking past the cafes was a bit of the strange experience. I called it, walking past viewing galleries. Moroccan men sit outside the cafes, sipping mint tea and people watching (most likely, women watching). Two men will not sit face to face but sit watching out, side by side, next to each other, often touching and enjoying a level of intimacy, not found among men in the US. Also very often women walked together linking their arms. Moroccan women don’t wear a veil but they may wear beautiful scarves and are mostly well covered. Both men and women wear lovely long flowing robes that are very comfortable, called the Djellabas. 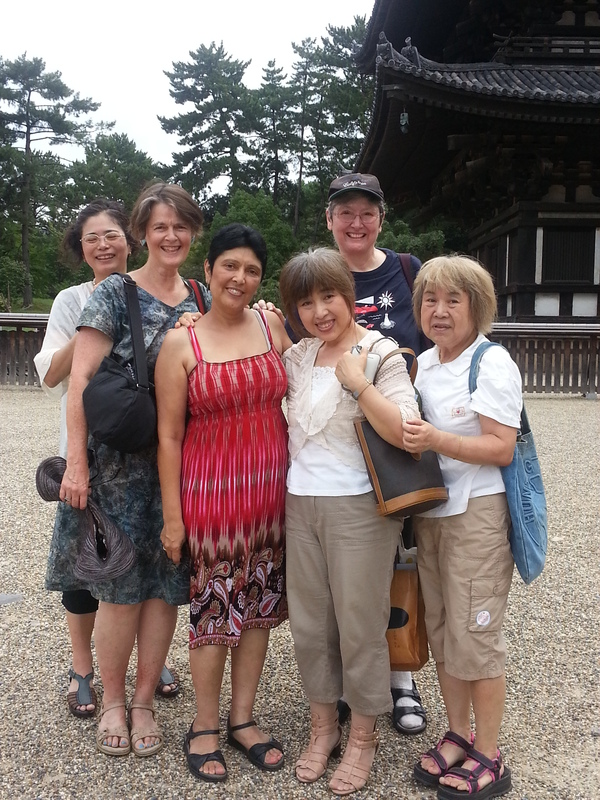 The best part of my trip to Japan was that we enjoyed different sites with so many of our Japanese hosts. Each one of them was wonderful, infinitely kind and gracious and truly made our trip memorable. We saw a lot of temples and shrines in Kyoto. 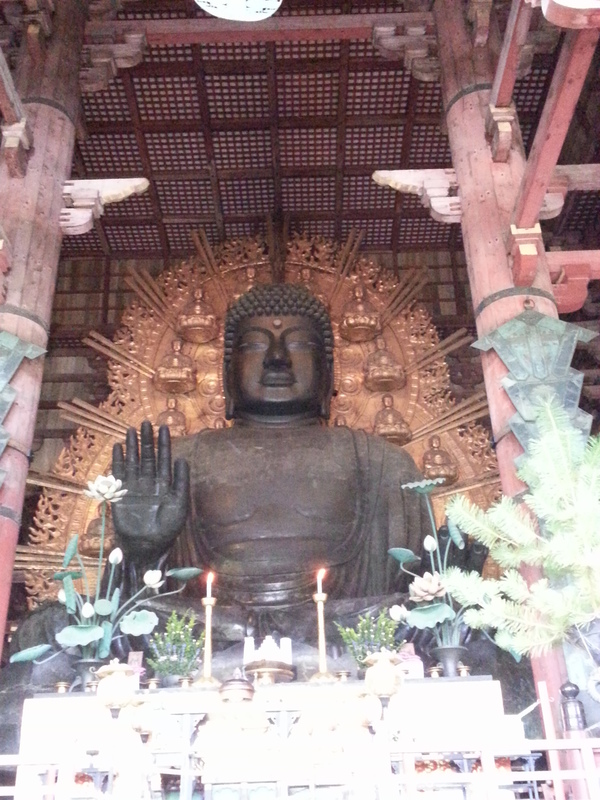 Kyoto is called a city of ten thousand shrines and has the most gorgeous shrines and temples. On first day in Kyoto, Piper and I met Hanada San and Nakagome San. These two ladies are 83 and 81 years old and have been best friends for over four decades. They are highly educated. Hanada San studied languages and Nakagome San has PhD in Chemistry. They use technology, accessed emails on their cell phones, and walked at such a fast pace and climbed stairs with such gusto that it would put young people to shame. I found that in place of typical Japanese softness and roundabout way of saying things, older Japanese women are very direct. They sit up so straight and exude such dignity as if every wrinkle is telling a tale of hardships overcome and character built. These two gorgeous women were completely straight forward and totally direct. Right away they made it abundantly clear that they were going to pay for everything, including meals, entrance fees, and various cab rides. They took us to Kinkaku-Ji gold temple. 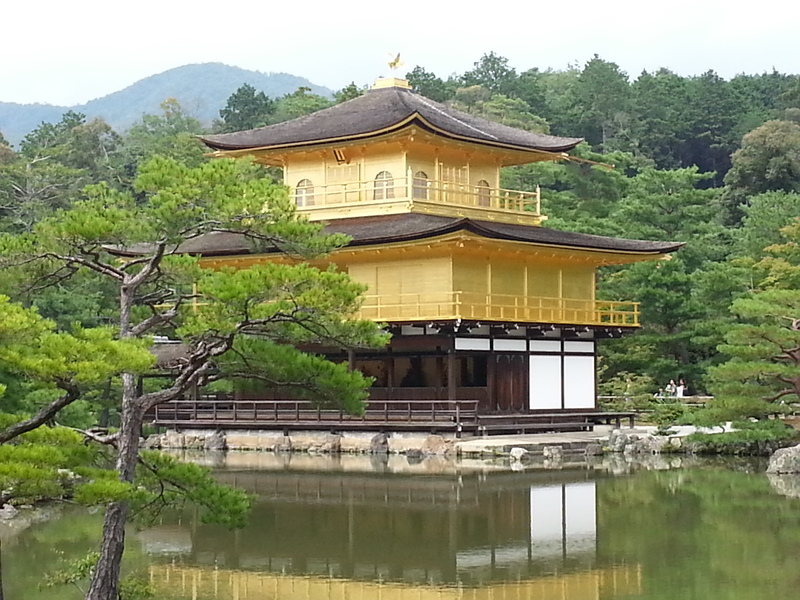 This is a zen temple whose top two floors are completely covered in gold leaf. There is another similarly named Silver temple, Ginkakuji that we did not see. Kinkakuji is absolutely gorgeous temple, overlooking a large pond. We could not go inside. But we walked around outside and took pictures. We went to a lovely restaurant with delicious vegetarian food for lunch. Then we took a taxi and went to see beautiful rock garden and lotus garden. Again the views were absolutely astounding and every place gave an idea of how seriously Japanese people take elements of beauty. Hanada San and Nakagome San were lovely company. Hanada San told me that she was just like my mother and I began calling her Mama San. We took a taxi and went to see a Shogun’s castle, called Nijo Castle. The castle castle has two concentric rings of fortifications, the Ninomaru Palace, the ruins of Honmaru Palace and various support buildings and several gardens. In 1601, the founder of Tokugawa Shogunate, ordered all the feudal lords in Western Japan to contribute to the construction of the Nijo castle. In 1867, the palace was the stage for the declaration of support to the emperor by Tokugawa Yoshinobu and the palace was returned to the Imperial Court. We were the last people to enter. As we walked past an area, the caretakers closed the doors behind us. We were the only people and so we clearly heard that as we walked by the wooden floors squeaked, but not in an annoying way. The floors squeaked like the sound of the bird and they called it the nightingale squeak. The squeak was designed to alert the shogun when someone was walking and so that no one would sneak up on anyone in the castle and yet it was designed to be gentle on the ears. It was a gorgeous castle with lovely views outside. We then went to Takashimaya, a huge shopping center and after some window shopping, went for dinner. 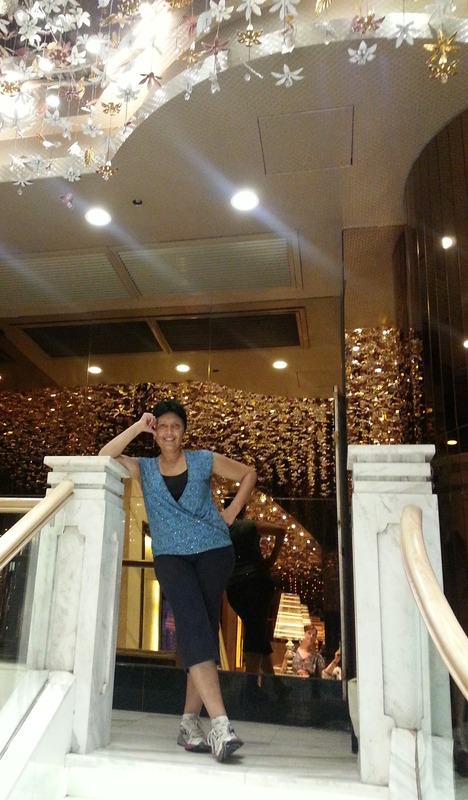 I wanted to climb up the seven floors, while everyone else took an elevator. The floors however, did not go straight up but veered sideways on each floor and finally when I landed on the 7th floor, I emerged in the warehouse of a huge grocery store. I made my way out of the grocery store but could not locate them. In English combined with sign language, I explained to the concierge to make an announcement for Piper, and they did. I got found, and we had a hearty laugh during the lovely dinner!! Hanada San and Nakagome San insisted on coming with us to the train station to buy tickets and stood waving goodbye at us for as long as they could see us. Awww I was soooo touched!! What a memorable day! 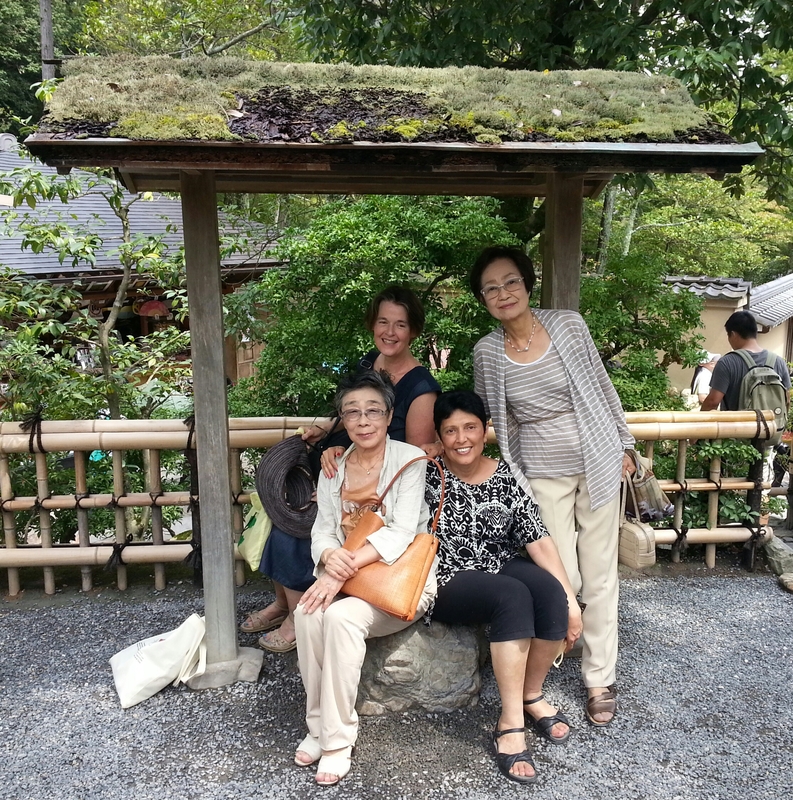 We enjoyed Kyoto again with Kozue and her daughters Hikari and Yuki and visited the Kiyomizu-dera shrine. Kyomizu-dera temple was founded in 780 on the site of Otowa Waterfall, and is added to UNESCO world heritage sites. The main temple juts out with a big wooden stage, 13 meters above the hillside below, offering gorgeous views of cherry and maple trees, along with the views of the city of Kyoto, in the distance. The main hall, along with the stage, was built without the use of nails. 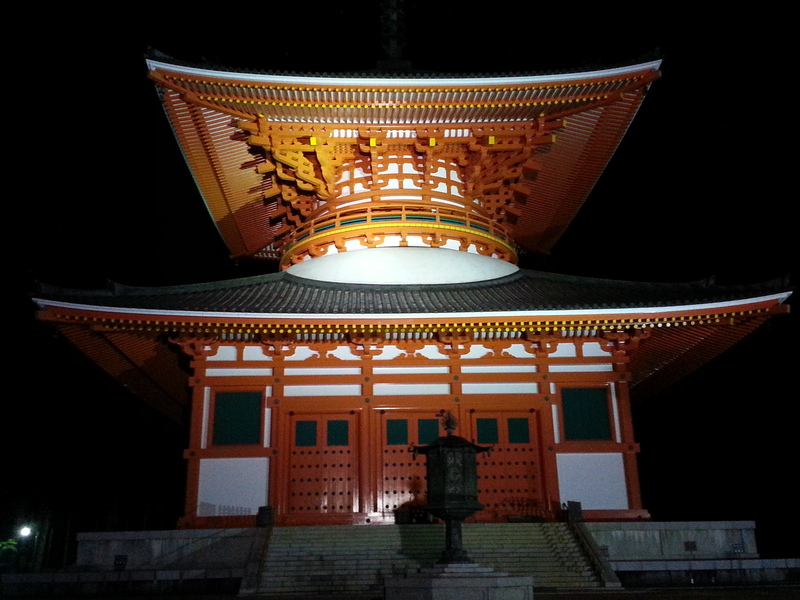 Behind Kiyomizudera’s main hall is the Jishu Shrine, dedicated to the deity of love and matchmaking. In front of the shirne are two stones, placed 18 meters apart. If you can successfully walk from one to the other, with the eyes closed then it is said to bring luck, in finding love. If someone guides you and you reach the other stone then it means that an intermediary may be needed, in finding love. At the shrine, there are many other little puzzles and special prayer places to help in finding love. The Otowa Waterfall is located at the base of Kiyomizudera’s main hall. 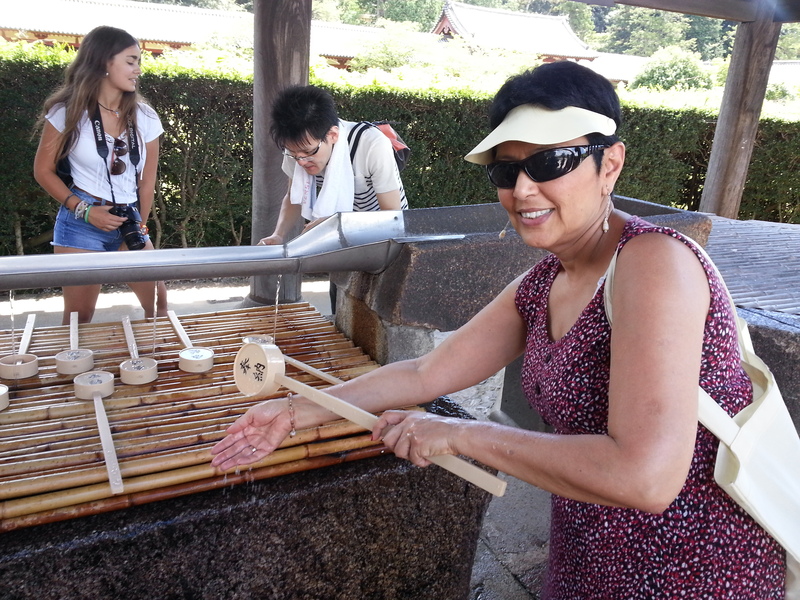 The waters come out in three separate streams and visitors use cups attached to long poles to drink from them. Each stream’s water is said to have a different benefit, namely to cause longevity, success at school, and a fortunate love life. However, drinking from all three streams is considered greedy, so you must choose, where to drink from. Important lesson in prioritizing! We walked up and down the souvenir street and then went to eat at hot pot restaurant for Okinawa cuisine. Kozue was immensely sweet and discussed menu for me at great length to make sure that I got completely vegetarian food. Later we walked around and enjoyed the Kyoto skyline at night and saw the reflection of the Kyoto tower on the glass building, opposite the tower and enjoyed the water fountain with music. 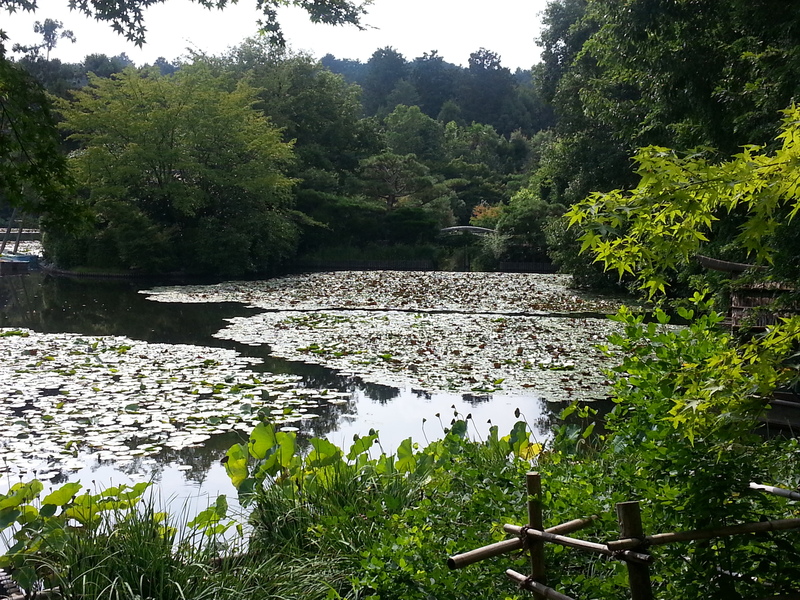 Later I enjoyed the visit with Lisa to the beautiful Byodoin Temple and garden. While walking back from the temple, we stopped at a tea shop and then walked to the station. But Lisa forgot her water bottle at the tea shop. So we parted company, as she went back to retrieve the bottle and I went alone to Fushimi Inari Shrine. Fushimi Inari Shrine is at a base of Inari mountain (Inari mens God of rice) and has trails that go up the mountain to many smaller shrines, across 4 kilometers. 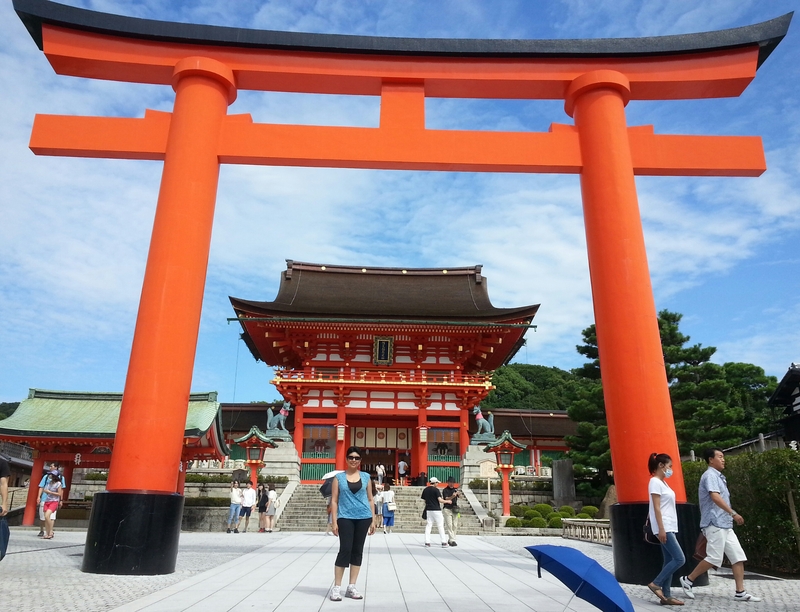 The distinctive feature of this shrine is that entire walkways up are lined with literally thousands of vermilion or orange tori gates. This is not only one of the most popular shrines among tourists visiting Japan but during Japanese New Year, it also draws several million Japanese worshipers. It was great fun walking up the trail. The highlight of my trip to Kobe was that quite unexpectedly, we ran into a Jain temple, even as I was explaining to Donna that during the religious days of Paryushan, I generally go at least one day to the temple and this may be the only year, when I would not be going, since I was in Japan. 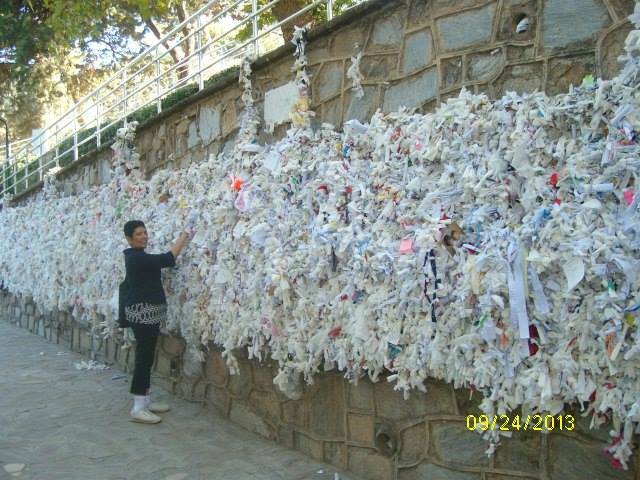 As we accidently came upon a Jain temple, Donna insisted that it was not a coincidence and these events happen in our lives, when we have powerful intentions and that it is a part of the divine plan. We walked in Kobe a lot. Also went to the harbor, which was beautiful. I love Manju, little Japanese dessert and ate a lot of that. Marie-San and her husband Hiroyuki-San picked us up from Barbara’s home in Nara. 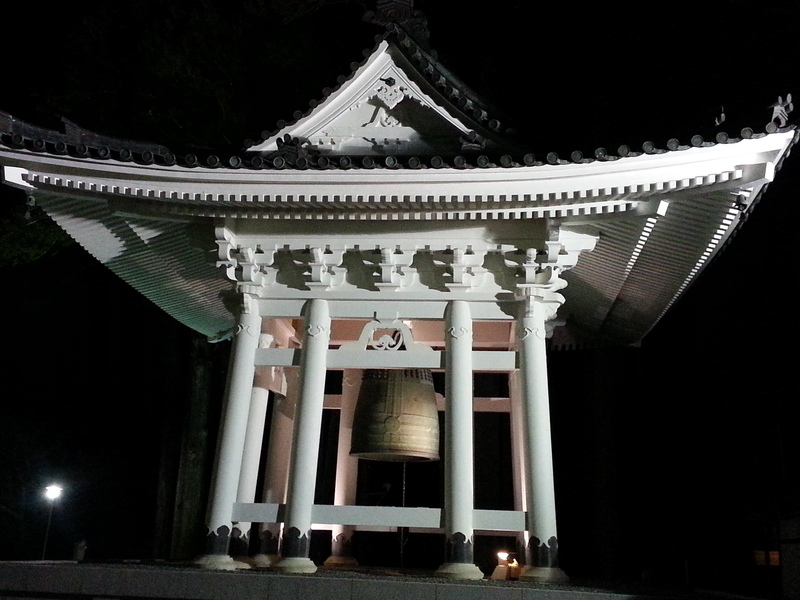 We drove for about 3 hours to a place called Koyasan which is a seat of one of the Shingon sect of Buddhism. UNESCO has declared Mt. Koya as one of the world heritage sites. Located in a valley amid the eight mountain peaks, it is supposed to resemble a lotus and hence the location was selected as headquarters of the Shingon Buddhist sect. We had a lovely lunch at a vegetarian place and then took a long walk where on both sides are beautiful graves of various people. At the end of the road the founder of the sect is laid to rest and there is the head temple or Kongobu-Ji. 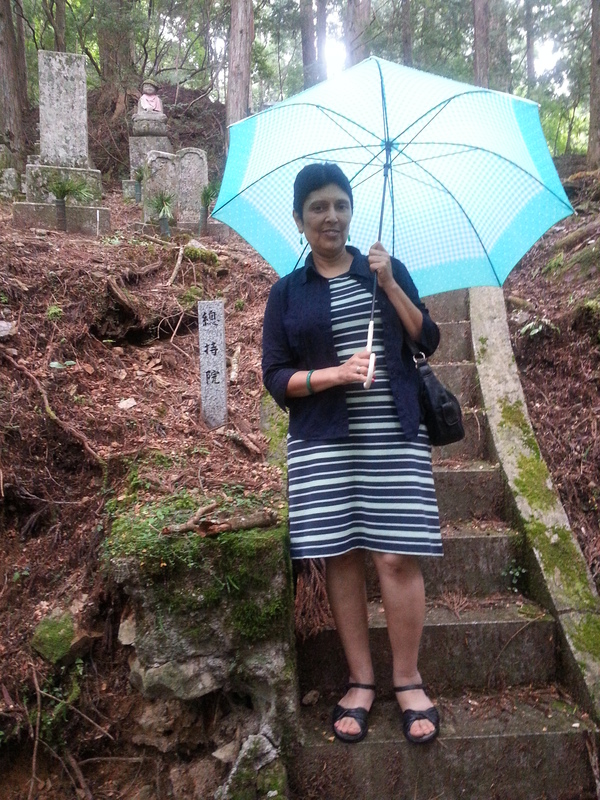 It started drizzling on our walk and Marie had brought umbrellas; so we walked in the gentle rain. It was a beautiful start to awesome experience of spending time at the Buddhist monastery where Marie had made our booking. At the monastery, at the entrance we were to leave our shoes at the door and use the shoes provided by the monastery. Our room was simple 6 by 6 tatami mat room, with a large table in the middle, where they served us welcome tea. 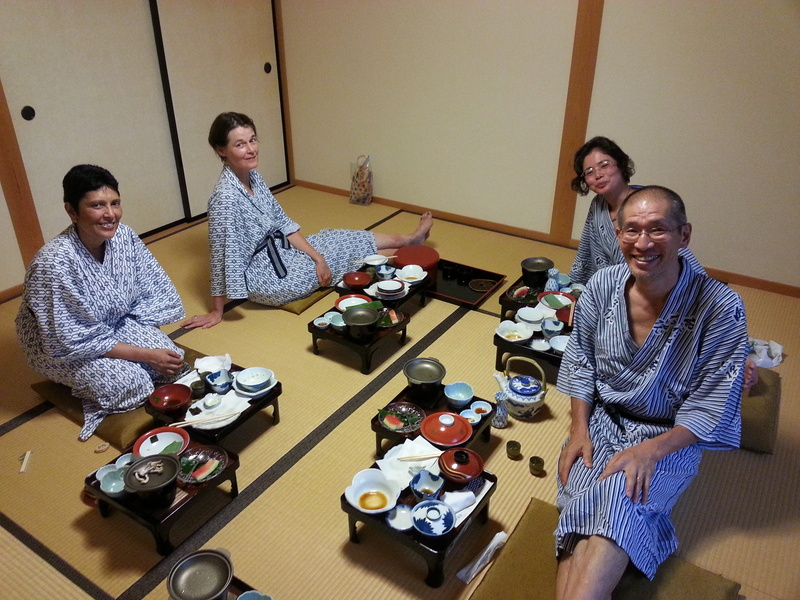 Marie and Hiroyuki came to our room and we all enjoyed the tea together. We ladies then went for the bath and men went into their own separate bath. This was my first Japanese bathing experience and it was wonderful. We each received a small wash towel and first scrubbed ourselves clean at our individual stalls. Each stall was equipped with a tap and a shower head, a sitting stool, shampoo, and soap. After thoroughly cleaning ourselves, we entered the bath and soaked in the warm water. We scrubbed our bodies clean and rinsed and then entered the bath and soaked in the bath. After we emerged clean and relaxed, we wore yucatas (bath robes) provided to us and then proceeded to a special room, where we were served dinner. I don’t have words to describe the dinner. It was amazingly beautifully served on two trays and had over 22 items and counting lids and chop sticks and chop sticks rester etc. there were 30 plus items. Each item was served decorated into each server. This was the most beautifully presented and the most delicious dinner I have ever had. After dinner, there was still some time before the curfew (at 9 pm). So we changed into regular clothes and went for a night walk and to watch the pagodas that were lighted. It was enormously beautiful. We returned before 9 pm and went to bed and were at the mantra chanting by 6 am. After an hour of prayers, mantra chanting, and a lecture by the monk, we went for breakfast. Again amazed by the care with which it was served and we ate in silence or minimally talking only when necessary. We then toured the garden and went to another temple for meditation. Here Marie had planned meditation training for us. After each set of instructions, the priest paused, while Marie translated in English for us. We then walked around the various pagodas and had lunch and started towards Nara. Upon reaching Nara, we went for supa cento. Those are public baths on a much larger scale. There were at least 15 pools or baths (by my count), baths that included cold bath, hot bath, outdoor pool, cave pool, salt bath, small bath tub, lying down shallow pool, jacuzzi with different jets, electric bathing pool, outdoor small pool with TV and there was wet sauna, hot sauna and so on. There were special massage baths as well for those who wanted to pay etc. This was a highlight of the trip. I enjoyed the Japanese bathing experience so much that I made a special request that Marie plan at least one more day of supa cento and she did even though she and Hiroyuki-San had to drive several hours to drop me back since I missed the train back!! Touring Japan was an amazingly refreshing experience. I will post a series of blogs, to cover different regions of Japan or different experiences I had in Japan. 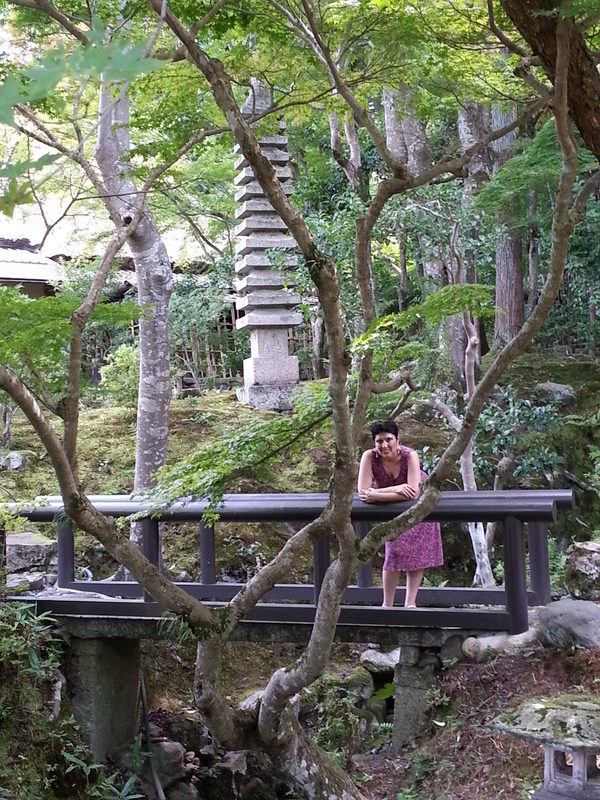 This blog is on our time in Nara. Nara is the capital city of Nara Prefecture, in Kansai region of Japan. As the plane was landing into Osaka, I looked down at the ocean and the scene with multiple ships similar gray looking ships (with only variation in sizes), looked almost exactly like the board of the game “Battleship”. I felt a bit emotional thinking about my father going to Japan, almost 45 or so years ago. He established great collaborations, with sole agency to sell Toshiba and National electronic products in Ethiopia and other parts of Africa, a business that brought much prosperity for the family, in years to come. Landed into Osaka airport and took airport bus to Nara where Barbara’s husband Iishu picked us up. They live in Byakugo-Ji, a small little village, in Nara. While Barbara, Piper and I went for a walk around the village, Iishu set the table and put finishing touches on the dinner. This place, a little eco habitat as Barabra calls it, is teaming with wild life. We had to ask Iishu to identify multiple sounds, at different hours in the day. The crows were the most vocal, noisy and as Barbara explained, most intrusive. Garbage had to be left outside in little netted boxes to prohibit crows from picking apart garbage bags and making a mess. Then there were certain types of cicadas that were buzzing till late in the night. The morning came alive by 4 am with sounds from sparrows, various birds and of course the crows. The village is dotted with gorgeous little houses. Daily I was the first one to get up and I went for a lovely walk and often saw older Japanese women tending to their gardens with great care. 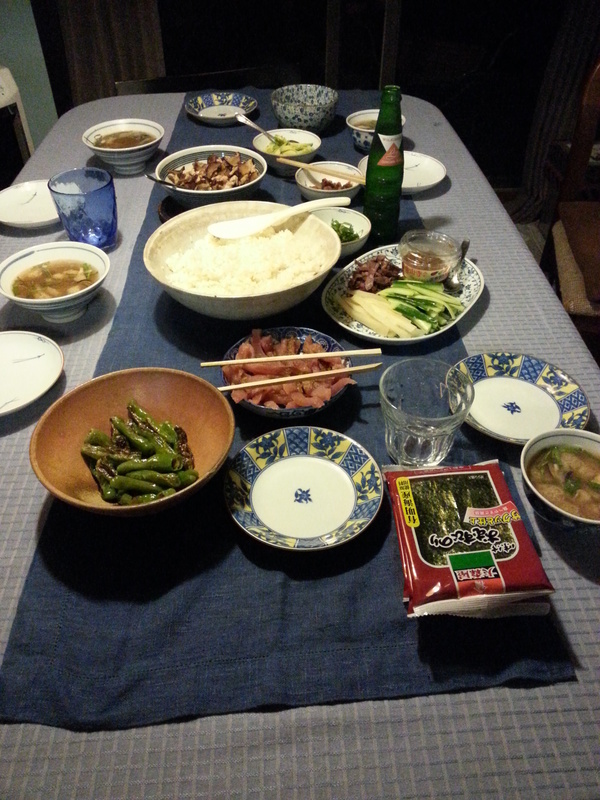 Iishu-San had prepared a lavish dinner with a some completely vegetarian items. The table was beautifully set with rice served in the bowl with delicious little plum pickle in the middle to represent the Japanese flag. We discussed itinerary and made calls and plans. 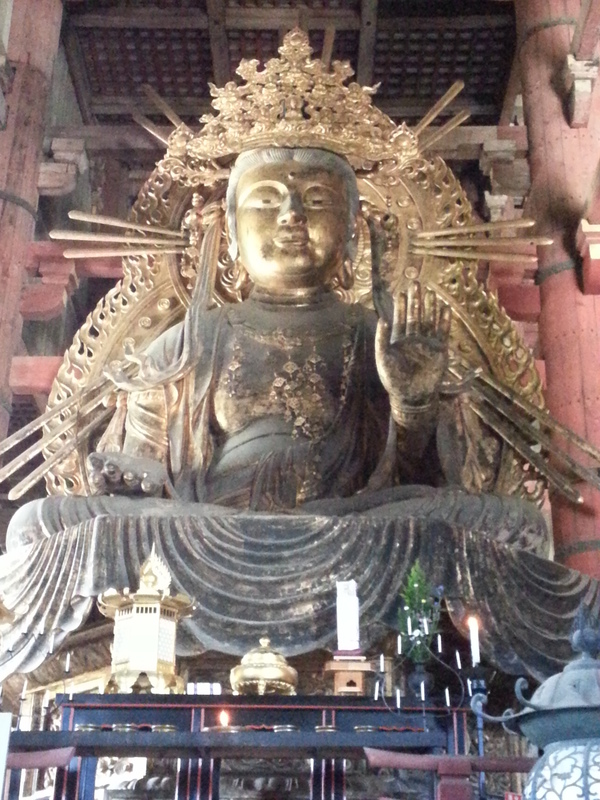 Next day, Barbara, Piper and I went to see the Big Buddha in Nara. There we wrote a message on a tile and donated it to the temple, for the roof. Barbara asked me to write something in gujarati and I wrote Aum Shanti. We then walked around, took pictures with the deer, one of them came and licked me. Deer in Japan don’t run away. In fact at Miyajima, one of them put his head into my bag that I had left on the ground and I chased him and picked up the bag so the deer kept following me. Then I became the one being chased, I was scared and started running away from the deer. Barbara, Piper and I went to a beautiful garden and walked around and took pictures. Then we went to a tiny Japanese restaurant and had cold udon noodles. Barabra explained in detail that I did not eat any kind of meat, including dashi (fish sause) which is ubiquitous in almost all Japanese cooking; and they were very gracious in accommodating our needs. We shopped for groceries and got home and I cooked Indian dinner; Chole to serve with nan, pavbhaji to serve with bread, and eggplant pulao, and bundi raita. They enjoyed the dinner immensely. We stayed a few days in Nara. Our hosts were extremely gracious. One day, after dinner, we got a special “show and tell” from Iishu-san. Iishu happens to be an artist and a phenomenal story-teller. From his childhood memories, he has made several small paintings and has special stories to go with them. He showed us the paintings and regaled us with stories, which were not only entertaining, but gave a deep insight into olden (pre-internet) days, into Japanese culture, and into his own life. One highlight was a rainy day when several friends visited us. We walked around Nara, did window shopping, shared umbrellas, found vegetarian food, and later had coffee in a beautiful cafe. One day, our host, Iishu-San took us to a temple of new Shinto order and we sat there, enjoying the rhythmic sound and ritual of the prayers. Touring Japan was an amazingly refreshing experience. I will post a series of blogs, to cover different regions of Japan or different experiences I had in Japan. Japan, it seems, is all about efficiency, but additionally, it is compassionate efficiency. That is to say, it is all about making things easier for others. And one always thinks of others, before self. You observe the efficiency in everything from the tender loving care with which the tiniest of gardens are nurtured that utilizes small spaces beautifully, to the way in which shoes are removed before entering homes, by turning around, so that when you leave, you can put the feet directly into the shoes, with ease. But the efficiency of the toilets just bowled me over. The toilets have numerous settings, bidet and behind washing etc. When you flush the toilet, a tiny wash basin behind the toilet starts to pour water to fill up the tank. One uses that water pouring into the wash basin to wash hands. There is a slight inconvenience to reach over the toilet to wash hands, but it leads to extreme efficiency in water usage as the same water used for washing hands will be used to flush the toilet in the next round. Some toilets start playing music as you enter, so that you do not have to listen to the sounds of other people doing their job. I was so fascinated by toilets and each time examined them carefully. In one toilet, I noticed a little contraption on the wall opposite the toilet. I could not quite understand Japanese writing but when I pulled it down, it came down as a little seat. 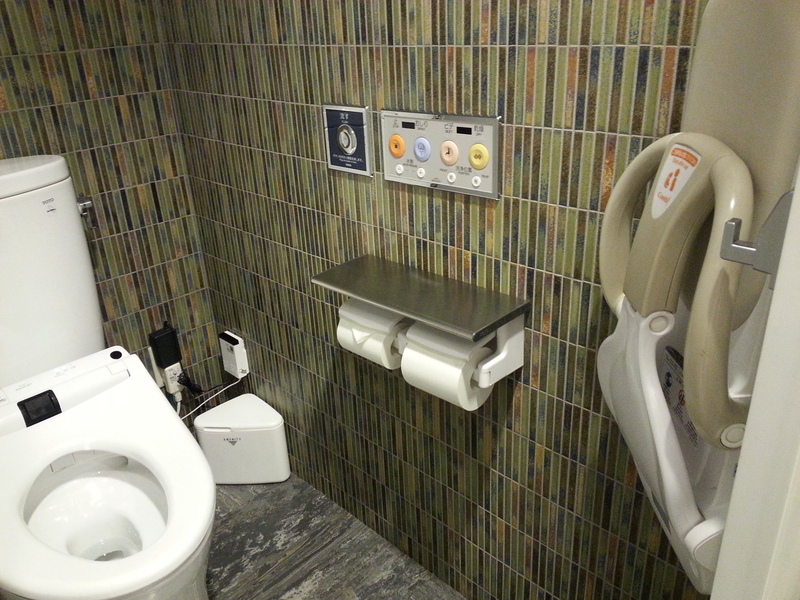 And from the picture, I realized it was a seat for a parent to sit on while their little toddler was on the toilet. Fascinating! 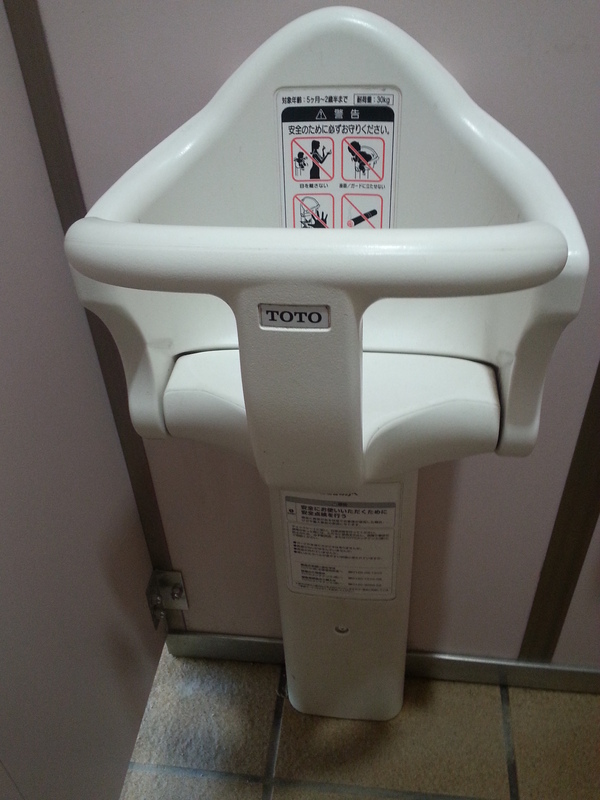 In another toilet, there was seat to let the toddler sit while the parent needed to use the toilet. Now I wonder how exactly we used the toilet while carrying a child and with no place to put the child down. 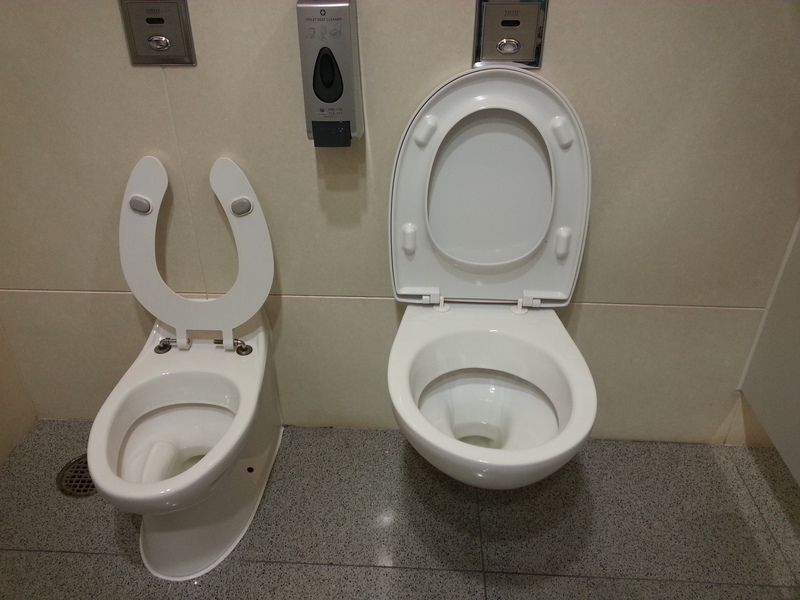 And then there was one where both a parent and the toddler can use the toilet, side by side. Compared to the US, while the toilets are much smaller in Japan, they include these little conveniences because someone thought about it. Japanese efficiency is different from German efficiency. In both systems, the train comes on time and both countries are efficient because they both have a set of mostly rigid, unbendable rules, and they have cultivated a mindset to stick to them. But consider this fact about Germany. I read somewhere that “everything there has to be done exactly as prescribed (no exceptions). There is no point waving madly at the bus driver to let you on after he has closed the doors: the timetable leaves no time for compassion”. It is a tad different in Japan. Similar unbendable rules underpin the efficiency, but the rules include compassion, thinking about the community, graciousness, and respect for others. How so? There is a rule that after the train leaves the station, the conductor needs to make one round in each compartment. Then it reaches the next station and he or she gets up and again makes one round (in case anyone needs any help). Each time, whether the passengers acknowledge his presence or not, the conductor is required to acknowledge the passengers and render himself approachable, by bowing to the entire compartment, as he enters, and again, as he exits. In another situation, we went to stay at a monastery. We were required to take off our shoes at the door (as is customary also in every Japanese home), and were given a set of shoes to wear inside the monastery buildings. All shoes were exactly the same and therefore interchangeable. 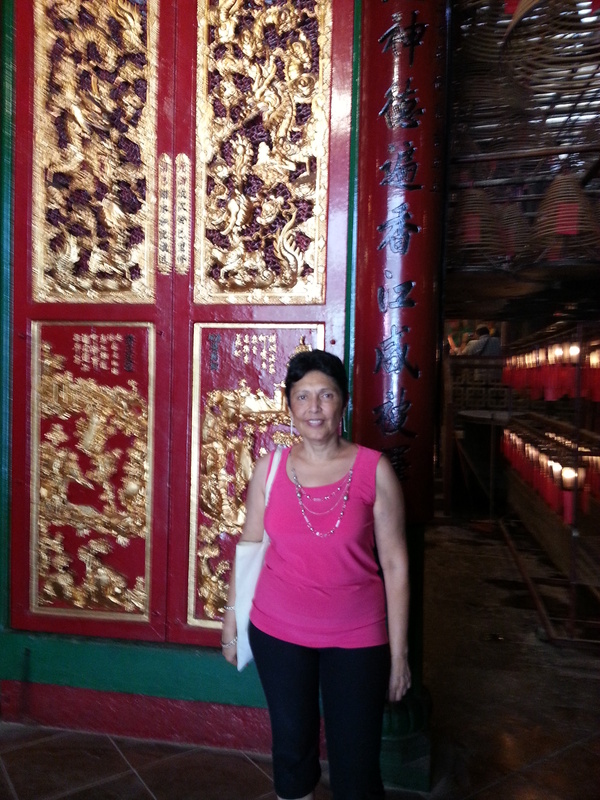 One morning, we went to pray in the Buddhist temple. We all removes shoes at the door. Me and my friends were the last in coming out of the temple. 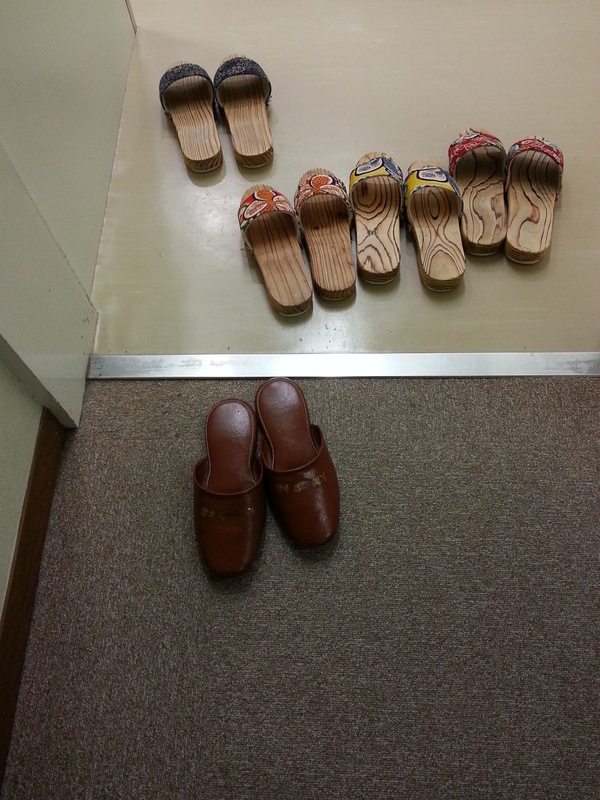 I presumed that shoes closest to the door will be taken by the others, who came out before us. To the contrary, everyone coming out makes extra effort to take shoes furthest away, so it will be easier for others coming after them. 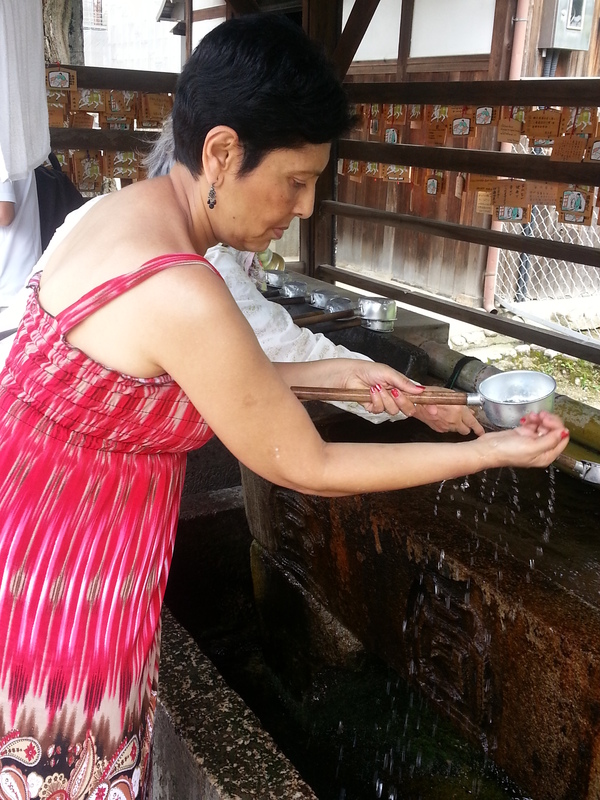 Before entering every temple, you are required to wash your hands with a ladle, by the water spigot. The hand washing is ritualistic and has to be done exactly the same way. And it was thus explained to me. You pour water over right hand, once that is washed, you hold the ladle with the right hand and pour water over left hand, and then you lift the ladle such that the water pours over the handle. The reason you do this is because after both your hands are cleaned, the water goes over the handle and it is cleaned for the next person to use. I found Japan to be incredibly clean but once when I was looking to throw some garbage, I could not find any garbage bins. Then I asked someone how did they manage to keep the country so clean, without any garbage bins. She explained that in order to eliminate security threats and to lessen the work for the city, they have minimized the garbage cans, and people just take their garbage home! Everytime one enters a place of worship, one is required to take off the shoes and wear another set of shoes to be used inside. One time, as we came out, I dumped the shoes given and promptly took my shoes and I was ready. The next one to come out was 81 year old Nakagome-San. She took the shoes of every member of our group and laid them on the floor such that each of them can put their feet directly into the shoes. I was totally ashamed that it had not even occurred to me that I should get everybody else’s shoes and keep them ready for them. Thinking about others is such an integral part of Japanese mindset that with the Japanese, it is a habit. Thinking about the community and others, before self, is just how things are done and in the process, it enhances efficiency and ensures smooth running of the system. Unfortunately, in some instance, things have gone awry when majority in the group engage in something inappropriate, and no one would challenge the community or the majority. 80,000 is the estimated number of the protesters at one point, this week in Hong Kong, demanding political reform. Here are a few more numbers & some disparate facts, before I share about my recent visit to Hong Kong. Hong Kong has the world’s 6th highest GDP (PPP) per capita. Hong Kong has been ranked first in terms of economic freedom for 20 years (1995-2014) according to the Heritage Foundation. According to one 2013 survey, Hong Kong was the world’s fifth largest foreign exchange market, in terms of turnover. Hong Kong was one of the most active markets for raising Initial Public Offerings or IPOs. 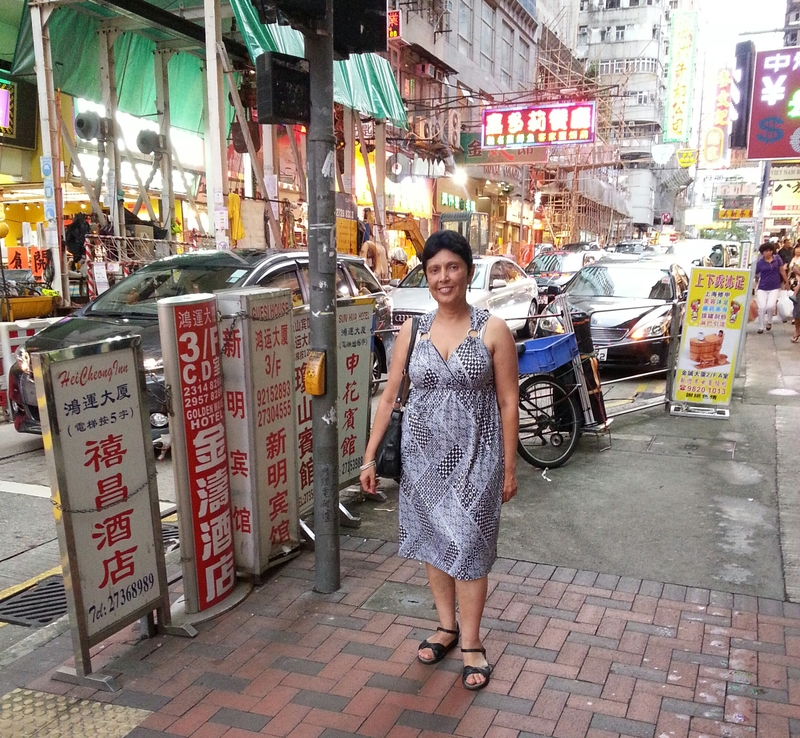 Mainlanders pour in Hong Kong bringing with them money and culture clashes. In 2010, 20M mainlanders visited Hong Kong, last year, 41M, and the number is projected to be 100M annually, by 2020. While Hong Kong GDP has risen by 50% in the last decade, the median household incomes have risen by only about 10%, causing wide income disparities. Average income of people younger than 40 dropped by more than 11% between 2000 and 2010. Number of elders age 65+ is expected to go up from the current 1.0M to 2.6M in 204, while there are likely to be fewer working age people to support the elders. According to a recent survey in Chinese University of Hong Kong, 1 in 5 people said they would consider leaving the territory for a life overseas. I did not enjoying my visit to Hong Kong very much, especially right after touring Japan, Hong Kong felt like a city without a soul. When you consider the statistics above, it is not hard to imagine why. Hong Kong is primarily a commercial center. Culturally, there is a huge diversity but there is hardly much inclusiveness. Populations seem to be segregated by class divisions, along ethnic, racial and cultural lines. Consider for instance, this statistic. There are an estimated 200,000 female domestic workers from other countries, living in Hong Kong. They mostly work as maids for the city’s wealthy families. 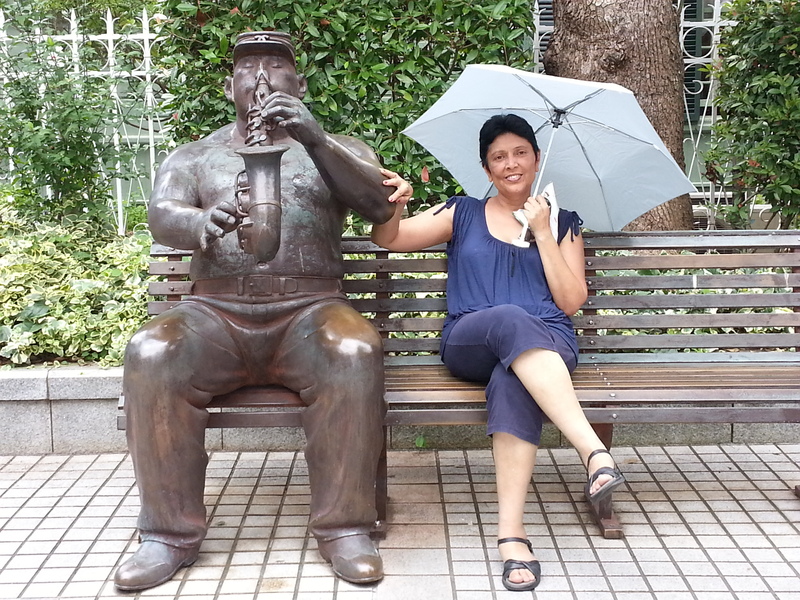 I happened to be in Hong Kong’s Statue Square, on their day off. They all gather on Sundays and visit with each other, play cards, eat, sleep, style each other’s hair and trade romance books. Apparently, these “helpers” often work twenty four hours a day, six days a week. Very likely, they don’t get paid enough to go eat out or enjoy movies on their one day off, and they simply gather in Hong Kong’s stations, parks, or outside public buildings. I learned, that these maids are often yearning to go home, frequently go to bed hungry, are often sexually harassed, although there are some who are very happy with their employers. Similarly, stereotypes about young and old, about classes, and different ethnic groups abound. I heard many stereotypes. One of the newest cultural divides has occurred between Hong Kong residents and mainland Chinese. On one hand, the mainlanders are bringing with them money and are creating business opportunities, and giving Hong Kong economy a boost. On the other hand, they annoy Hong Kongers, who see the mainlanders as uncouth, uncultured, and ready to get their kids to pee over a trash can. Anyway, one of the highlights of the trip was a visit to The Peak, the highest point in Hong Kong, in an exclusive, classy neighborhood. We enjoyed absolutely incredible, breathtaking vistas of one of the most spactacular cityscapes, in the world. What we see is an architectural evidence of the economic boom that hit the city, after the colonial power handed the former colony back to China, in 1997. From here, you can feel the incredible commercial city humming below this amazing vantage point. I could have stayed there all evening, but the heat was a little much for my travel companions. we strolled over to a little cafe and enjoyed our cool lemonade, in the shade. The Ten Thousand Buddhas Monastery, located in Sha Tin, in the New Territories, occupies an area of over eight hectares. My travel companions were not interested in hiking up the steep hill, in order to reach the monastery. 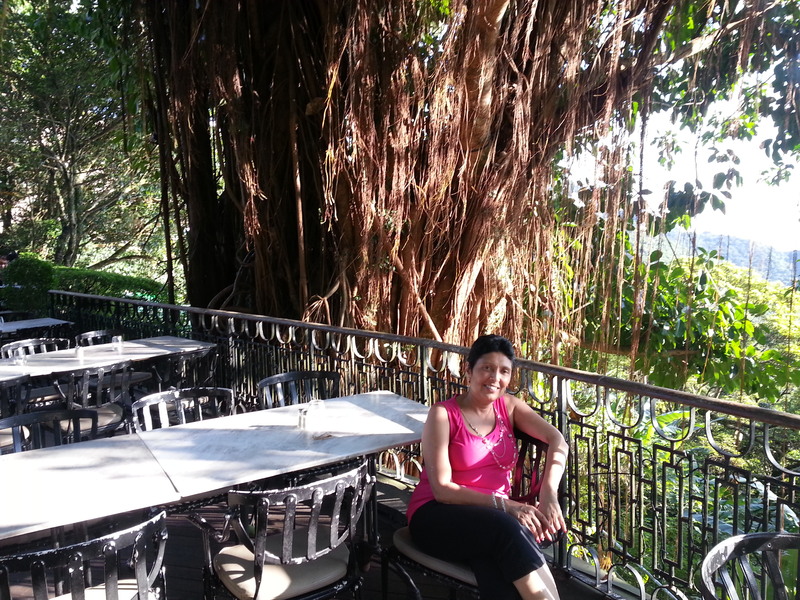 So I went alone, while they enjoyed a cool drink and waited for me at a cafe below. I climbed up the steep concrete path comprising of 431 steps, lined on either side with 500 life-sized gilded Arhan Statues. At the top, there are five temples, four pavilions, one verandah and a pagoda. The monastery was constructed between 1949 and 1957 but then it took ten more years to complete the miniature Buddha statues, displayed around the walls of the main temple (apparently there are about 13,000 but in Cantonese tradition “ten thousand” represents a figurative term for an extremely large number. 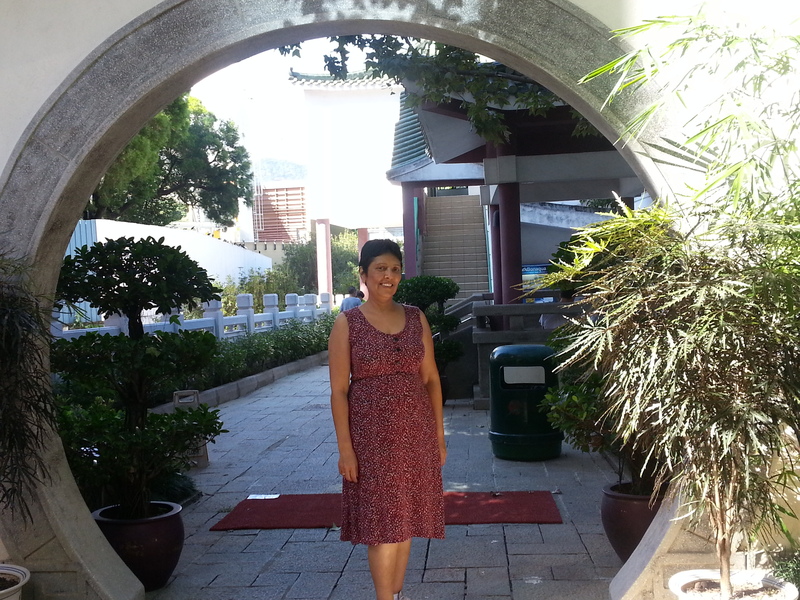 Our visit to the island of Macau was interesting. Macau is one of the world’s richest cities, with the highest GDP per capita, by purchasing power parity, as of 2013, according to the World Bank. Of course the reason I wanted to go there was to try my luck at the casinos in Macau. Macau became the world’s largest gambling center in 2006. In a mixed blessing, I won a large amount of money and then either I dropped my large bill or it was stolen somehow. Easy come, easy go. My travel companion was not interested in gambling and that halted further attempts on my part to try my luck. We walked over to the historic Portuguese center of Macau (Macau is a former Portuguese colony) and enjoyed some Portuguese cuisine. Going shopping is and always has been one of my least favorite activity and did not greatly enjoy it. But massive and glistening luxury shops and huge bank buildings and other skyscrapers give an idea of the trade that is flowing through Hong Kong. The protesters in Hong Kong are demanding real political reform. While Beijing is willing to hold elections, it has announced that all candidates have to be approved by a screening committee, clearly in violation of China’s 1997 promise to allow free elections in 2017, according to the protesters. Hopefully, the clamor for democracy will also spark opportunities for real dialog and change around broader issues of human rights like income disparities and ethnic tensions. Xi’an is capital of Shaanxi province in Western China. It has more than 3000 year history. At one time, most important connection between the East and the West was through China’s Silk Road, where goods (which included a lot of silk) traveled from East to West. A great deal of cultural exchange occurred through the Silk Road. Xi’an is the starting point of the Silk Road. And now it has become more famous after the discovery of the Terracotta Army of Emperor Qin Shi Huang. Our cultural knowledge also was enhanced in Xi’an. 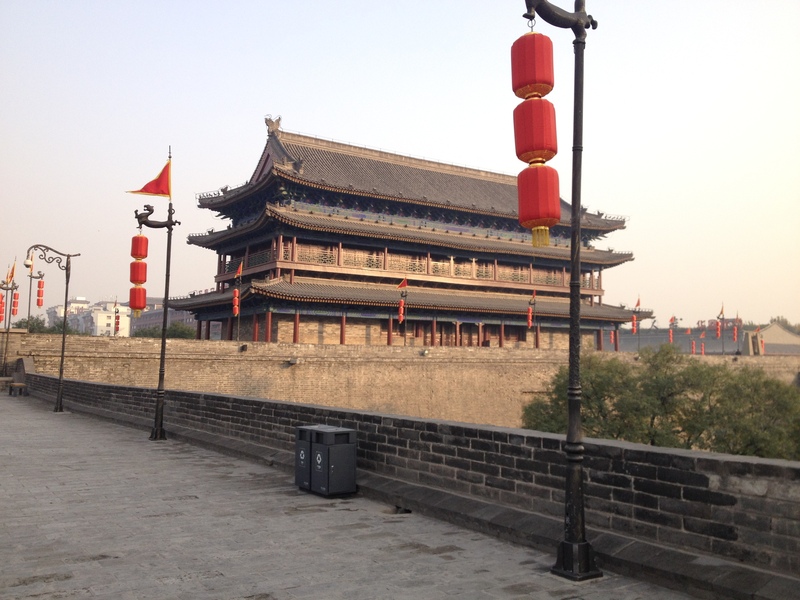 On the first day, we visited the ancient wall that surrounds the city. It is absolutely beautiful. We also visited the Great Wild Goose Pagoda. In the evening, we went to a show that depicted emperor Huang’s dynasty. My friend and I decided to walk back to the hotel instead of riding back with the tour. At several places, people were doing Tai Chi or were dancing and at couple of places, I joined in the fun and found the people to be very welcoming. 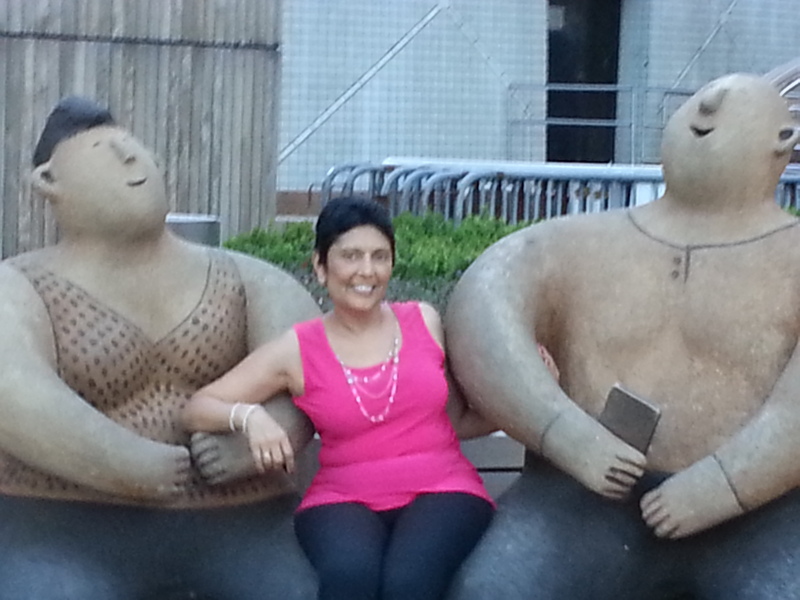 Next day, we visited the Terra Cotta Warriors. 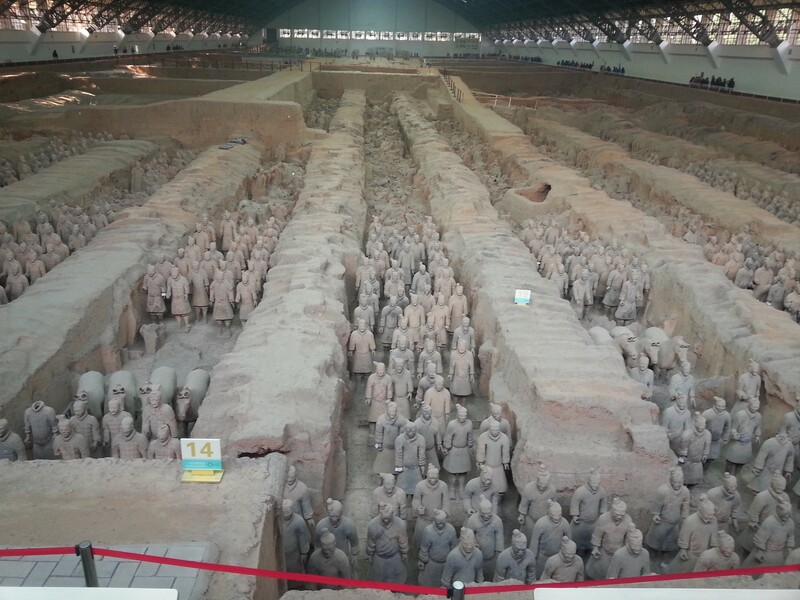 Emperor Qin’s Terracotta pits are located 1.5 kilometers from the emperor’s mausoleum. The pits were never mentioned in the historical records and at one time pillaged and wrecked and then remained buried until 1974. In 1974, a farmer was drilling a well and happened to come upon them. When President Clinton visited China, he wanted to meet this farmer and the farmer was apparently taught some English and some easy answers – like how are you, I am fine, me too etc. When Mr. Clinton shook his hand and told him “I am Bill Clinton”, the poor farmer replied “me too”. Many people consider the Terracotta pits to be the Eighth Wonder of the World. And they are truly amazing. The largest pit measures 230 meters in length and 63 meters in width. The works is endless and still ongoing to excavate and restore the warriors. It is assumed that 6,000 warriors and horses will be unearthed from this pit alone. All the statues are life size and exquisitely made. About 40,000 bronze weapons have been unearthed from the pits. They are exquisitely made and coated with chrome-saline oxide coating, which protected the sharpness of the weapons and retained their shinyness. The emperor has to be a complete megalomaniac to have built such an huge army to be buried, when he died. Obviously it makes something quite uncomprehendingly amazing for future generations. 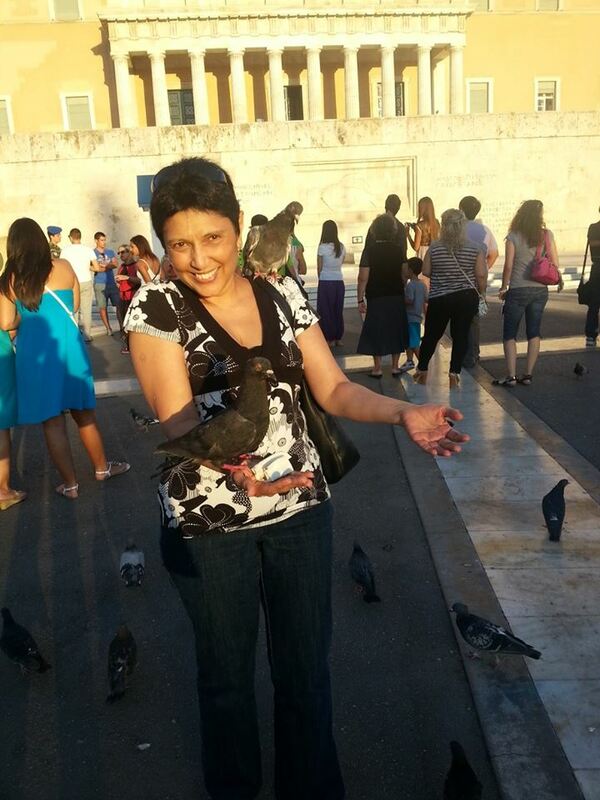 For this tour, we boarded ship at Piraeus, suburb of Athens, Greece, on Holland America Cruise Line. First stop was Istanbul, Turkey, then Greek island of Lesbos, Mitheline, then Turkish island Kusadasi, then Greek island Mykonos, and then Greek island Iraklion, Crete. Athens has a lot of history and while there is much to see, the Acropolis or hill on which the most famous Parthnon is situated, is historical and wonderful site. Around 490 BC Pericles began construction of the buildings on the acropolis. Many buildings were damaged in 1687, during siege by the Venetians and during other wars. Some have been restored. Most famous one is a temple dedicated to Athena Nike (Nike means victory and Athena means wisdom). Vying for power, Athena won the battle against Poseidon, God of the sea and the temple was therefore dedicated to Athena. While Poseidon offered water, Athena offered olive tree as a sign of peace and was declared the winner. To the right of the entrance, the Propylaea is also beautiful. To preserve the impact of the Acropolis, there is a restriction on the height of the buildings in Athens, so the Parthenon remains the highest building. Athens is full of olive trees and beautiful buildings, marred by unimaginable amount of graffiti, perhaps indicative of the economic troubles. Similar to Spain, nearly everyone smokes in Greece. The Constitutional Plaza or Syntagma Square, opposite the Parliament is a great hub of activity. We walked around there, ate peanuts, offered some to the pigeons (who were immediately sitting on our hands and head for food), and watched the change of guards, at the entrance of the parliament, with big pomp and circumstance. Istanbul, Turkey was the fist stop on the cruise ship that we boarded at Piraeus, Greece. Istanbul is a gorgeous city adorned with many mosques, blaring every now and then with a lyrical calls to prayers. Istanbul is a crowded city, humming with activity. 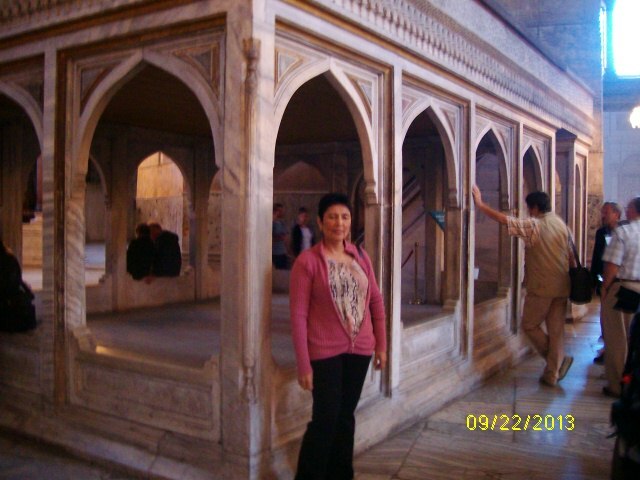 We visited the Ayasofya Mosque, also called Hagia Sophia (meaning holy wisdom in Greek) mosque and museum. It was a former Greek Church, later converted to Imperial Museum, and in 1935 was opened as a museum by the Republic of Turkey. It is absolutely spell binding. We also visited Sultanahmet Camii or the Blue Mosque, so called because of blue tiles surrounding the walls. It is a historical but functioning mosque. You need to go there modestly dressed, with a scarf, (if you do not have one then it would be provided). 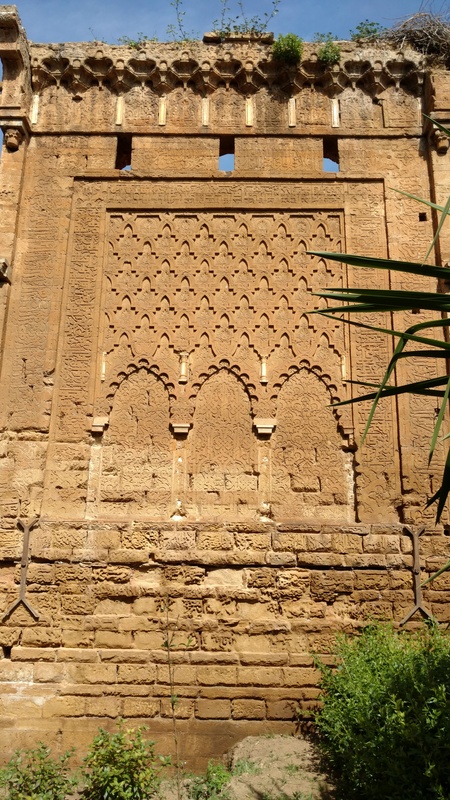 The walls outside are inscribed with beautiful writings from the Quran. The Basilica Cistern, the largest cistern, built in 6 century BC (apparently by 7000 slaves), lie beneath Istanbul, and provided a water filtration system for the Great Palace of Constantinople and later to the Topkapi Palace. It is about 105,000 square feet in area and is one of the most memorable sites, I saw. At one end, there are columns with visage of Medusa (blocks oriented sideways and inverted to negate the power of her gaze). The cistern was the location of 1963 James Bond film “From Russia with Love”. Topkapi Palace museum consists of four main courtyards and many smaller buildings. After entering the gate of salutation or bab-us-selam, you enter Divan Meydani, a gathering place for courtiers. Several building inside house the extensive imperial treasury, the arms collection, clock collection, royal home of the emperor, home of the queen mother, courtyard of the eunuchs, and more. We could have spent days there but only had couple of hours. Later we walked in the park, shopped for Turkish candies topped with nuts, had Turkish desert filled with pistachios, almonds, and hazel nuts, looked at the range of turkish spices, took picture of the man making pomegranate juice and then savored the delicious, tart-sweet juice, with corn on the cob, sesame bread, and roasted chestnuts. Mytilini is the capital of Lesobs, a tiny island in northeastern Aegean sea. The island is covered with olive and fruit trees, has a petrified forest (which we did not get to see) and has a huge Molyvos castle. Walking around on the grounds of the Mediterranean’s largest fortress with over 200,000 square meters was an incredible experience. The views from every angle are simply amazing. This was not a guided tour but everywhere there are boards with explanation in English and we wandered at our own pace and took tons and tons of pictures. Lesbos is well known for Ouzo, the traditional distilled Greek drink that tastes very much like Sambuca. I saw a sign for Ouzo and went in the distillery and asked the man what exactly was Ouzo and he promptly showed his distillery where it was made and brought out some ouzo for us to try. Kusadasi, the coastal town of Turkey is known for the ruins of Ephesus. Ephesus, once a port, was an important commercial center, on account of its strategic location. It is located in fertile valley with delicious fruit trees all around. In ancient times it was also religious center of early Christianity. There is temple of Artemis (fertility goddess) built in 356 BC, which was one of the seven wonders, at one time. The city continued to expand and built by successive rulers but new rulers in AD 262 sacked it and the city was abandoned when the harbor silted up. It has since been rediscovered and is a great tourist attraction. The ruins give a great insight into the lives of the people. We had a leisurely drive to Ephesus, to see the ruins. And then we visited the house where Virgin Mary is believed to have spent her last days. I took the opportunity to tack a prayer to Virgin Mary. Among million other prayers, will she get to mine? As you land on the shore of this tiny beautiful island, you are greeted by the small Paraportiani church. This tiny town of has some 70 little churches. Votive offerings is an old tradition. As per one tradition, the residents enshrine the bones of their dead in the walls of the shrines. As you walk a little further, you come to the enormous seven 16th century windmills that were used to store grains. These windmills are now the trade mark of Mykonos. On the other side, is little Venice with colorful balconies hanging above the sea. There are many beaches, and we visited one, though we did not venture out in the ocean, to swim. 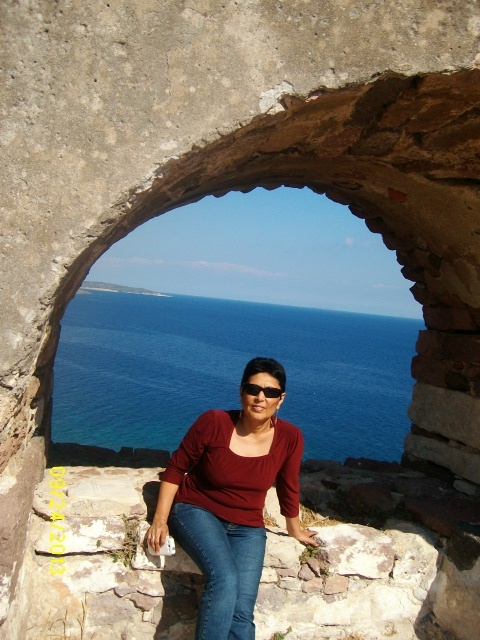 I Loved this small, beautiful Greek island, east of Turkey. It is absolute clean with all the houses pained white and doors and windows painted in bright hues of all diverse colors. We had a leisurely walk through the island, a short trip to the beach, and then a lazy walk through the long market street. We broke and ate pieces from the loaf of bread that we got from a local bakery as we strolled through the market street, buying little knickknacks. The final highlight was meeting the respected Pelican, Petros. The ancestor of this Pelican came to the island around 1954, after a storm. He was welcomed and since then he and his descendants have lived on the island and all are called Petros or Pedros. Petros is official mascot of Mykonos. As we were walking through the market street, Petros regally strolled in and as we all reverently made way, Petros simply strolled through the town. 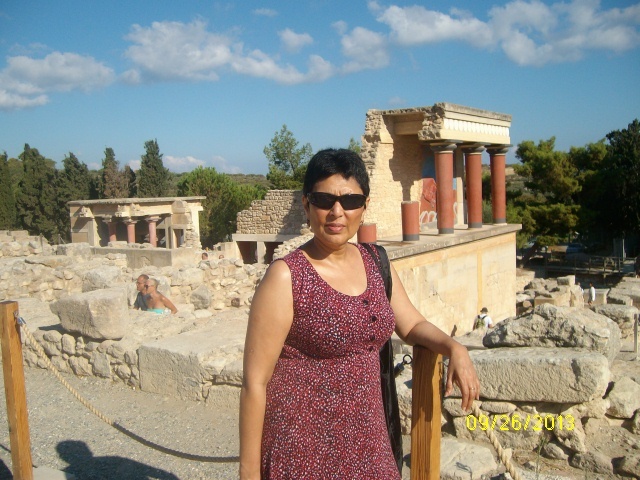 The Palace of Knossos is the primary tourist site in Heraklion. It was built during the Bronze age (ceremonial and political center of the Minoan civilization) and was discovered in 1878. The palace was excavated and partially restored in early 20th century.